Last week I took an overnight trip to Buckeye Lake to visit my friend Rae, who was up from Florida for a week. I had some clothes and a cane that she had left in our van when we were all in New Mexico in June. It was a nice visit. We had lunch with Belinda and Stephanie on Wednesday and then stopped at Half Price Books. Rae liked a pair of glasses that Stephanie had gotten there, so she decided she wanted a pair too. Then we stopped at Graeter's for some ice cream. It was a fine afternoon, but Rae tired quickly (from chemo treatments) and so we drove back to the lake to rest. This journey of Rae's got me thinking that we need another Rae story...or as some people call it...Lucy and Ethel or Lavern and Shirley. 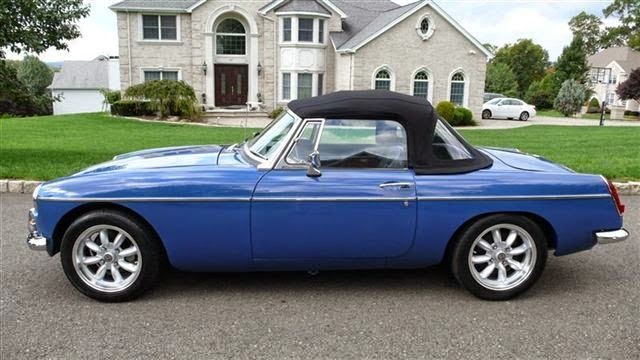 So...here goes...It began with me driving my cute little blue MGB to the Grove City Library...long, long ago...in the 1980s. I had a typical love hate relationship with that car. I should never have gotten it as my one and only car....it worked fine on days where I did not have to scrape ice off the windshield. If it got that cold...I usually had to fine another ride to work. But on that fall day, the sky was blue, the leaves just beginning to change from green to red, yellow and orange. I was in a good space, driving down the expressway, singing with the radio. I noticed a strange odor and wondered if I needed to change the air filter in the car. I had a trunk load, because for some reason, (the dealership never satisfied me with their explanation) I was told that I must be driving through dirty air...like in a farm field that was dusty. After numerous trips to get this fixed, I found it easier to have some spare air filters and change them myself. I was so fast at it, I am sure I would have qualified to change air filters at the Indy 500 pit stop. This is what my MGB looked like. I loved it when it was running right. (This post really will have Rae in it...but I have to set up the background.) I was almost at the exit when I noticed smoke coming from the dash. Panic set in, but not enough to make me stop and exit the vehicle. I was going to make it to the parking lot of some grocery store that was right off the exit. It was not that far. By the time I got to the parking lot the inside of the car was filled with smoke. I jumped out of the car expecting it to explode...glad that I had parked far from other cars. I stood at a safe distance watching the smoke dissipate, and then slowly approached the car. Everything looked okay, but I was not about to try to drive it anywhere. I found a pay phone and called Rae, hoping she would be able to pick me up. Fortunately, she was available. 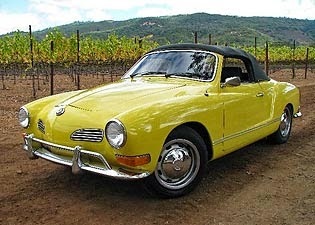 Rae drove a little yellow Karmann Ghia with a black convertible top. I called it Bumble Bee. She picked me up and told me I was lucky to be alive. We began discussing what to do with my car when the Bumble Bee started shaking and weaving. Rae uttered a few choice words as she pulled the car to the side of the expressway. Flat Tire! Of course, we were stopped at one of the worst places...71 and 270. Cars were flying by us, vibrating the Bumble Bee. and inside the car...all waving like princesses. Flat tires are no big deal. I had changed them before...and being an expert air filter changer, I felt quite confident that we would be back on the road soon. I opened the trunk, pulled out the spare and then searched for the jack. Once found, it just felt odd, like it was missing a piece, like a foreign object...German engineering. I stood back, checked the trunk again, found another part and soon had it figured out. Feeling quite proud of myself, I told Rae to make sure the emergency brake was set. "I can't," was her reply. "Kevin broke it last time he drove the car." Poor Kevin, her son, seemed to always get blamed for any car problems. Whatever...I did not see how we could jack up the car if the brake did not work. "I will just stand in front and hold it," was Rae's solution. But I nixed that thought. I could just see the car rolling over one of us. We were quite relieved to see a car like this pull up behind us. Just like in the movies...when things seem dismal...in comes some help. An Ohio State Patrol parked behind us and an officer stepped out. Those of you in Ohio know that the officers are always dressed impeccably (Maxine would approve of their attire.) This officer was...well, I will just say it. He was well built and handsome. Maybe I was looking through the veiled eyes of someone in need of a rescue...but this man was our hero. He tried to jack up the car knowing that the brake was broken, but thinking it might work. The car would roll each time it got so high. The officer decided that if I held the car on the front and Rae on the back that it might work. Hmmmm....I had my doubts....but we tried...and it did! Yay! My hero! Next, taking off the lug nuts. At this point Rae told him that the car was used when she bought it and had no idea how long it had been when the last tire was changed. I think she knew that those lug nuts were probably rusted on. The officer worked and worked trying to loosen one of the nuts. Soon, he removed his hat, setting it inside the car to keep it clean. I saw a glisten of sweat on his forehead. He tried turning that lug wrench some more. Veins protruded from his forehead. Stopping to wipe the sweat from his head, he also took off his jacket....setting it neatly inside the car. Back to the job...grunt, jerk and work some more. By this time he had two lug nuts off. When he took off his tie, I knew that he was determined to win this battle. The tie took its place next to the jacket. Rae and I were still holding the car. Soon, our hero's shirt was unbuttoned at the neck. His face was red and sweat was dripping from his nose and chin. I felt kind of bad, but continued dutifully holding my end of the car in place. Finally, the last lug nut was removed!! Our hero stopped to catch his breath before placing the spare tire in its new home. Lug nuts were tightened and the jack lowered the car. Oh no! The spare tire was flat too!!! Our hero put on his tie and jacket and held his hat. He said he would call a tow truck. I could not believe he was admitting defeat!! I had one more idea! Fix-a-Flat!! There was a can of that in the trunk. He seemed relieved that we might finally have a solution. The can was shaken, the tube was attached to the air valve and soon Fix-a-Flat was pouring into the tire. But all of our smiles changed to dismayed surprise. 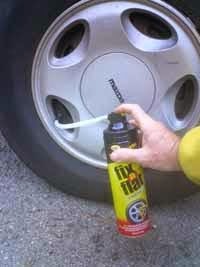 The Fix-a-Flat solution was foaming through the tire walls. The spare tire was more damaged than the other tire. Rae and I noticed our hero was gone...he was back at his car calling for a tow truck. It would arrive soon and take us to a gas station. "I hope to #$@% that it is a Shell station, Jackie. That is the only credit card I have with me." That was about all Rae said....until the officer was called to another emergency. "Have you ever seen a Highway Patrolman take off his jacket? When he unbuttoned the top two buttons on his shirt...I was waiting to see what would come next!" My reply, "He seemed so glad to get called to another emergency." And then I did it...I started to chuckle...I pictured the cartoon my Uncle Frank would draw of us holding the car while the patrolman worked up a sweat. I could not stifle the chuckle. Rae looked at me and said, "It's not #*@% funny, Jackie...but he sure did have a good build, didn't he?" And soon, she was laughing too. Within minutes, the tow truck came, hooked up poor little Bumble Bee and we were off to a gas station. We drove down some country road and in the distance, to our surprise, saw it....a Shell station. It was our lucky day! Here are a few pictures of Rae. Kevin and Rae, taken at my wedding. with the sun shining on her. For other Rae stories check these links. The all time favorite has been Water Fall. But these others are almost as popular: Sew What? , A Flood of Memories , and Rae Uncovers Our Dirty Laundry . What a day that was!! It sure wasn't as you planned it but the reality of the events and the way you wrote about it makes for great reading. I love both cars, your and Rae's resiliency and your friendship. Wow! Talk about compounding problems. It is always good to be able to laugh when looking back at an adventure although there was nothing funny about at the time it was happening. Glad things worked out for you and Rae. Great story...how one misfortune turned up another. But, you certainly kept your sense of humor! Rae sounds like an awesome friend. What a kick! Loved reading your story. I'll have to check out some of the other Rae stories. One misfortune after another . . . and then a Shell station! First of all, I absolutely love the premise of your blog! Memorializing a family's history is the greatest gift we can give to future generations :-) I loved the crescendo ending of your Rae story, as well...it was your lucky day!